Queensland’s capital city of Brisbane doesn’t always feature on the backpacker or gap year students’ radar and when it’s competing with heavyweights, such as Sydney and Melbourne, you can kind of understand why. However, for all savvy travellers in the know, this river-side city is right up there with the best of them and when it comes to cultural and recreational things to do, Brisbane certainly holds her own against certain others on the east coast. With a superb zoo, which once boasted Steve Irwin as an ever-present animal handler, and an equally impressive botanical gardens, that can be found at the base of Mount Coot-tha, the capital is full of surprises and well-worth a visit no matter what you’re in to. If you’d like to discover an alternative to the more frequently visited areas of Oz then check out our list of top 10 things to do in Brisbane and before you know it you’ll be singing the praises of this glorious city just like a local. Of course, enjoying the outdoors doesn’t have to be quite so energetic and for many people the chance to take a hot-air balloon flight is at the top of their wish list. So why not do it in Brisbane? There’s a heck of a lot to see as you sail effortlessly away from the city and out into the countryside and the chance to enjoy the east coast of Australia from such a unique perspective has to be experienced at least once in a lifetime. Most tours include the sun coming up as well as a cheeky visit to one of the nearby vineyards and there’s no better way to pop an all-important question other than drifting into the clouds with a glass of fizz. There’s just something about city living that inspires the locals to hanker for coffee and Brisbane is absolutely no different. You’ll find cafés and coffee shops dotted throughout the capital and from hidden gems, such as Gallery B at the back of Newmarket’s Hardware Store and Gillian’s Garden in the Cottage Garden Nursery, there’ s a whole world of long blacks and skinny lattes just waiting to be discovered. Other hot spots can be found along the Southbank and near the Gabba cricket ground in Woolloongabba and no matter what you’re after: tea and chat, coffee and cake or a full on brunch with all the trimmings, you’ll no doubt be treated to all of the above and much, much, more. Australia’s capital city is well-known for its love of live music and regular festivals along the Southbank are held within a succession of theatres and concert halls, including: the Lyric Theatre, the Playhouse Theatre and the Queensland Conservatorium. Aside from the classical performances and chamber choirs, you’ll also find plenty of live action in Fortitude Valley which is a district of Brisbane renowned for its nightlife and gig venues. The ‘Valley’ is also the home of a couple of annual events featuring live music, food stalls and plenty of drink stations and if you’re looking for a good time in the sunshine then this is the place to be. Other venues include: The Hi-Fi and the Powerhouse but, in the main, Fortitude Valley is where it’s at. Thanks to Brisbane’s semi-tropical climate the groves and vineyards just outside of the city are perfect for growing some first-class grape. This is a brilliant way to see a little more of the countryside as well as tasting and buying some excellent local wine to either take home or drink on site. Brisbane’s wine estates are some of the best in the whole of Oz and the majority can be visited either by bike, by car or on an organised coach tour. This is just the ideal way to spend the day and even if you’re not that fond of wine you’ll still discover a peaceful and picturesque alternative to the city skyscrapers. Anyone interested in the native culture and the history of Australia will be in their absolute element amongst the museums and sites of Brisbane and thanks to the city’s Living Heritage Network you’ll discover over 80 venues to choose from. The locals are really passionate about sharing their heritage and inner city sites, such as: the ANZAC War Memorial, Mercy Heritage Centre and St. John’s Cathedral all play their part in helping to tell the story. From museums about the police to the beautiful botanical gardens, Brisbane is literally teeming with cultural elegance and a sightseeing tour can really answer all of your questions as well as, undoubtedly, providing a few more. 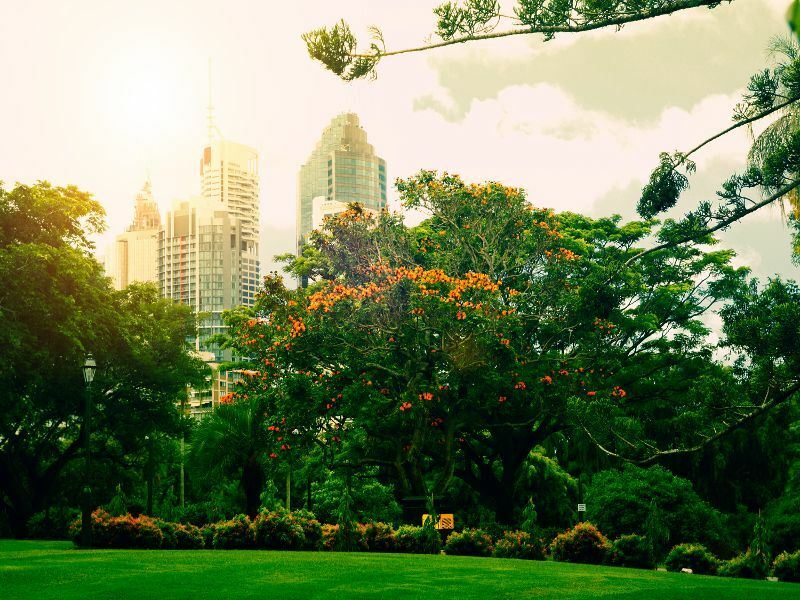 There can be few other more peaceful spots than Brisbane’s botanical gardens and if you’re into your horticulture or just fancy taking time out from the city, this is the place to be. Located at the foot of Mount Coot-tha a trip to the gardens can really offer an insight into the natural beauty of east coast Australia and taking an hour long walking tour will definitely let you into plenty of the local secrets. Open every day of the week and offering completely free admission means that visiting the gardens couldn’t be simpler and with loads of rare, unique and mature specimens on display you might even learn a thing or too while you’re there. Palms, figs and the old bamboo are complimented by a café and fountain which all make for a thoroughly delightful oasis in the middle of the city. All self-respecting river cruises will include at least a mention of Story Bridge and if you’re intending to get just that little bit closer then you can actually climb up the steel cantilevers for some incredible views and a real taste of Brisbane heritage. Not only does Story Bridge feature prominently in the city’s history it’s also a mainstay around festival time with the annual Riverfire display, held every September, setting off thousands of fireworks from the bridge’s archways. Climbing to the top is certainly one for the adventurous although, as you’ll be under the strict tutelage of professional guides as well as packing full harness gear, there’s no real danger. The ‘Lookout’ is one of the city’s most popular destinations and a must for anyone hoping to watch the twinkling lights pinprick the city around about dusk. This was once the home of indigenous Aboriginals and was used as a place to get honey which is how the mountain got its name. These days the only honey you’ll find at the summit will be in the café and restaurant which are also renowned for their super sweet views of the city. After a coffee, cake and plenty of photo ops it’s time to explore and mountain bikers and hikers will be in their element as Mount Coot-tha promises more trails than you can point a didgeridoo at. The Brisbane River snakes through the city in a similar fashion to the River Thames and although there may not be quite so many historic landmarks along its banks there are a fair few that should warrant your attention. As with most city river cruises, part of the attraction is the hospitality you receive whilst on-board and from laid-back lunchtimes to illuminated evenings, this is a relaxing and entertaining way to see the sights from a different perspective. Live commentary will no doubt answer many of your questions as you glide past skyscrapers, under bridges and past the lush green river banks that have served the locals since the 1800’s. There’s no better way to enjoy the Brisbane River than on the South Bank and if you’re intending to live life down under then this is probably one of the best places to start. Attractions range from an amazing 1km long flowering archway to an almost 200ft tall big wheel as well as loads of green space to enjoy a picnic while you take in the sights. This is one of the city’s main locations for outdoor live music with the Suncorp Piazza able to seat over 2000 people. Restaurants, cafés and even a man-made beach ensure that when the sun’s out then the Southbank Parklands is the place to be. If you like your activities on the slightly extreme side then you may want to pay a trip to the Riverlife Adventure Centre that promises professional instruction as well as the hire of bikes, scooters and roller-skates. Getting out there on the east coast is all about having fun and if you’ve ever wanted to go kayaking or fancied rock-climbing or a spot of abseiling, then the guides at the centre can show you how. Located close to Southbank Parklands, at Kangaroo Point, this is a must visit location if you’re hoping to fuel your adrenaline and enjoy the great outdoors.